1. To begin making the Chicken Souvlaki with Tzatziki recipe, firstly mix chicken and marinade in a bowl and keep aside to marinate for at least 3 hours to overnight. 2. Take marinated chicken pieces and thread into 2 to 3 skewers or more. 3. Heat some oil in a large skillet over high heat and place skewers on it for 3 minutes on each side, or until cooked. You can even BBQ it. 4. 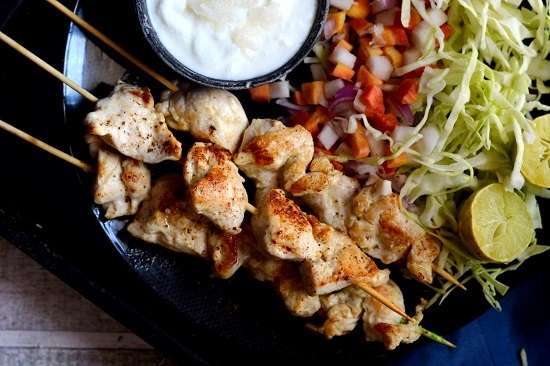 Serve Chicken Souvlaki with tzatziki, flatbreads, lettuce/cabbage and tossed salad. 5. The next step is to make the tzatziki dip. Peel and cut the sides of cucumber, coarsely grate it, squeeze the grated cucumber well and discard the water. 6. Place the squeezed cucumber in a bowl and add remaining ingredients and mix well. 7. Keep aside for at least 15 to 20 minutes for the flavours to blend. It is ready to be served. 8. Serve Chicken Souvlaki with Tzatziki along with Mujaddara for a weekend night dinner with your family. A greek dish in which Chicken breast are cut into equal pieces and marinated with Greek flavours, later skewered and cooked. Chicken Souvlaki is typically served with flat bread where they are filled with lettuce, some tomatoes, salad and wrapped with Tzatziki. Tzatziki is again a flavorful dip made with Greek yogurt and grated Cucumber. An ideal condiment for wraps and rolls.